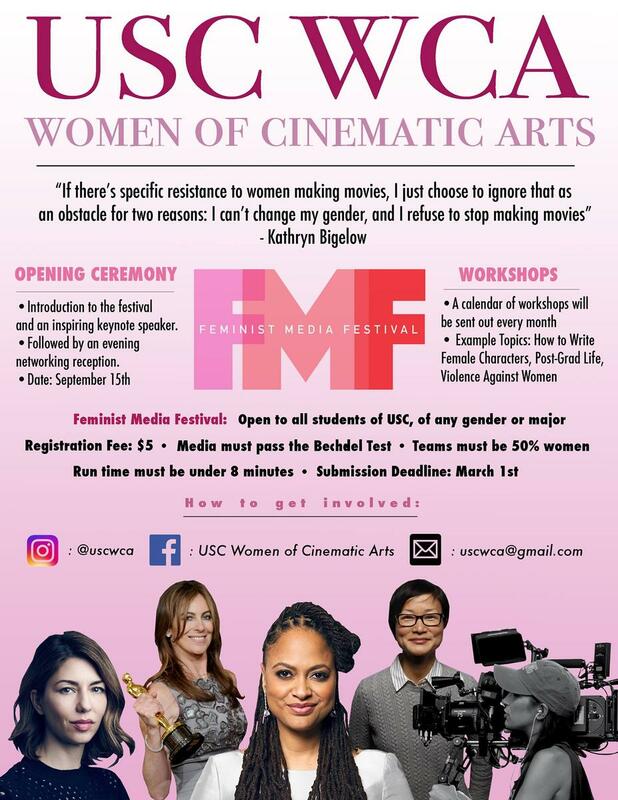 Women of Cinematic Arts (WCA) was founded in 2005 by a group of students, faculty, and alumni who felt that female filmmakers were grossly underrepresented in the entertainment industry. This was before the current media spotlight on inequality in Hollywood, so efforts to make a change were not as visible. The founders felt that real change would have to come from the root—college. If women were able to find and make connections in college, they thought, they would be more likely to have a network once they graduate. SCA’s current undergraduate population, for example, is fifty percent female. This week WCA is launching their first annual Feminist Media Festival with their opening ceremony on September 15th. The festival will take place throughout the school year and will consist of workshops, networking opportunities, and guest speakers that will lead up to an awards ceremony in April. The festival is organized and run by students with the help of faculty and alumni, with a goal of encouraging networking and collaboration. Jones says the Feminist Media Festival “is all about connecting and showing everyone that there are really awesome creators who are women and minorities. That’s the goal.” The long-term hope is that this festival will inspire change both in today’s industry and beyond. Launching the opening ceremony is keynote speaker Haifa al-Mansour, the first female Saudi director. Al-Mansour wrote and directed Wadjda (2012), the first full-length feature to be shot entirely in Saudi Arabia and the first made by a female Saudi director. Over the next few months, there will be panels of screenwriters, professors, and many special guests offering advice and networking opportunities. Jones says their vision of creating a festival came about when a board member described Hollywood as “an old boy’s club” where men in power hire their friends who are also men. Their hope is that the festival will become an annual event that all students look forward to, no matter their gender, major, or class ranking.